An old story tells us that when the Maya Indians of Guatemala had worries they would tell them to the worry people who would take the worries away. 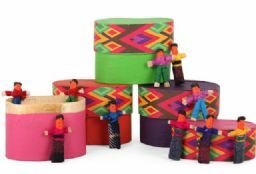 Thess handmade product have been made by the Maya Indians who live in the highlands of Guatemala. They make their living from agriculture in the rural areas of the country and are often dependant on alternative forms of income. Let the Guatemalan Worry People take all your worries away! Guatemalan Worry Doll Mirror "Don't Worry You Are Beautiful"